A prisoner, who spied on other prisoners for you. A Confidential Informant can provide tons of information about contraband in your prison. You can access this feature by selecting Intelligence > Informants. You can find such information as current location of contraband as well as arranged drop points where a prisoner will go retrieve the item. You may even get lucky enough to get to know about Escape Tunnels or a prisoner who is targeted for removal. In order to recruit informants, a prisoner must be in solitary confinement and be available for recruitment. Click the Experience tab in the prisoner's profile to see if they can be recruited, if so, click "Recruit Informant". You will see a yellow circle around potential informants in solitary reading "Potential C.I." for prisoners that are ready to get out of solitary immediately by helping you out. Existing C.I.s will have a yellow circle reading "Confidential Informant". You must have a Security room to question an informant, as they will be brought here when you click the Activate button next to their name. The higher "coverage" rating they have, the more of the prison will be disclosed to you. When hired, an informant will have a coverage of max. 50%, but an informant's coverage will slowly increase over time (beyond 50%), as long as his suspicion is low and he is not "active". Beware that each activation will raise suspicion and searching a prisoner/cell with contraband while the informant is active will greatly increase their suspicion. Revealing reputation of other prisoners is automatic and does not raise suspicion. You can activate multiple informants at one time and their coverage will compound, but this is not an incremental increase (22%, 15%, and 20% will not give 57% coverage). Any prisoner labeled as a Snitch is a target and any informant whose suspicion rises too high will be a target for elimination. You may encounter prisoners who have a red target symbol around them such as Former Law Enforcement. If not placed in Protective Custody, these prisoners will be disposed of by the population. Of course, snitches may be found among prisoners with unknown reputations, and can be revealed by active confidential informants or identified if they are attacked. It is recommended to place the individuals in Protective Custody and alter their Regime so that they are not in populated rooms with the rest of your prisoners, as their stay will be cut short. And even so, ensure there is sufficient security in areas those said prisoners will visit. Changing their status to Protective Custody at any time will cause them to quickly lose their coverage of your prison. The information gathered from informants will not be utilised automatically by the guards or given to the player. 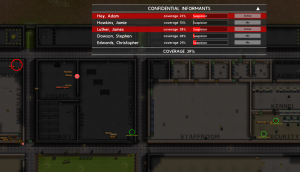 You will have to check the Informants view in the Intelligence menu regularly to make use of this feature.